Designed as an executive style home office, this contemporary log cabin is remarkably spacious. It benefits from a brilliantly unique design, ensuring it really stands out from the more traditional outdoor buildings. Its pent roof also makes it ideal for installation in gardens with height restrictions due to low hanging trees. 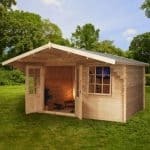 The cladding is one of the stand out features of this cabin, offering an outstanding 35mm thick tongue and groove build. Once treated, this building will withstand anything the weather throws at it. The corner joints chalet connections increase its durability, whilst also adding a very attractive, stylish design. Four large, tall windows are added to provide excellent levels of natural lighting into the building. As if that wasn’t enough, the door also features a single glazed design. It is also worth pointing out that you can opt to upgrade to double glazing which will add a lot more insulation as well as security to the building. Speaking of security, the doors feature a mortice lock which is embedded into the actual door, rather than just on its surface. This is one of the best, most secure locking systems available. 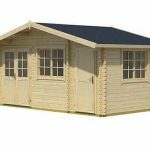 With a fantastic choice of upgrades and customisation options, this is one of the best quality outdoor buildings currently on the market. 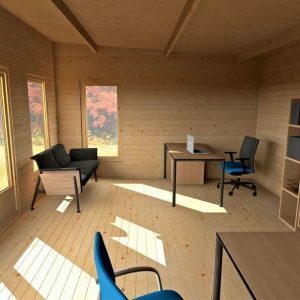 This is a very impressive, wooden log cabin, primarily designed as a home office. What we like about this building’s design is that even though the cladding is extremely thick, it doesn’t come with a bulky appearance. In fact, from the outside you’ll see that the building has a very smooth, flat design. This is enhanced by the pent roof. Even the doors appear to be recessed. It is this streamlined style that helps to give it such a contemporary look. Although it is designed as a home office, there’s no reason why you couldn’t use this building for other purposes. For example, it could make a great home gym, a games room or even a relaxing additional living space. Imagine escaping into your own little bubble for some ‘you’ time. 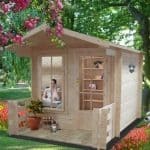 Well, with this comfortable, impressive log cabin it can give you the space and peace that you need to recharge after a busy day. 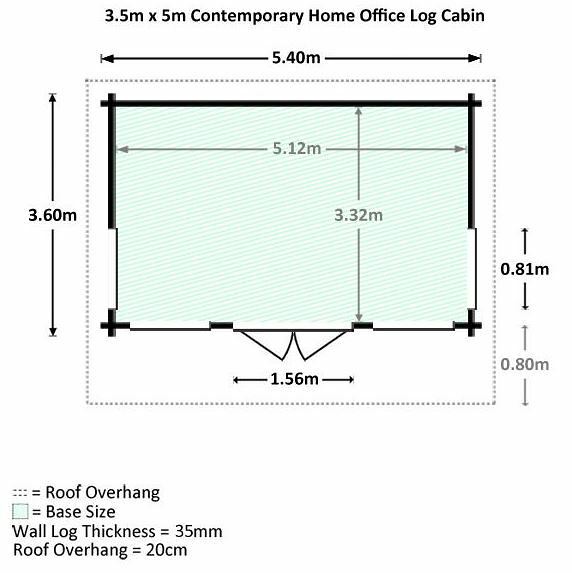 As you can see from these measurements, this cabin is definitely on the large side. What isn’t noted above, is that the rear of the building is actually slightly shorter than the front. This is because of the pent roof which gently slopes downwards towards the back of the cabin. The back measures 2.36m, while the front measures 2.50m. It’s only a slight change, but this unique design makes it suitable to be installed under low hanging trees. The height of the building is also pretty substantial considering it doesn’t have an apex roof. It doesn’t matter how tall you are or what you are planning to keep in the cabin, you can be sure you’ll have plenty of space thanks to these extra-tall measurements. Both the roof and the floor are made from incredible quality 19mm tongue and groove cladding. This is thicker than what you find on outdoor sheds, though is actually pretty standard for log cabins. It increases the rigidity of the building and ensures you can add heavy furniture, such as desks, filing cabinets, chairs and even gym equipment or a pool table. Whatever your plan for this cabin, you can be sure the floor will support anything you want to install. Floor bearers have also been included so the building is raised slightly off the ground. This adds to its rot resistance and keeps the timber off the potentially damp ground. 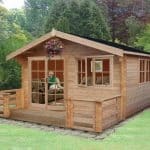 The standard variation of this Barbados log cabin comes with 34mm log tongue and groove cladding. However, you also have the choice to upgrade to 44mm cladding, helping to not only make the building more secure, but to also keep it warmer and more insulated in the winter months. Although the cost of upgrading to the thicker cladding is expensive, we do recommend it if you have the budget. You can find out more about the benefits of this thicker cladding in the customisation options section below. Whichever thickness you do opt for, the tongue and groove construction gives the cabin a strong, interlocking support. As the boards interlock, this creates not only a water resistant barrier, but also protection against high winds too. One lesser known benefit of this form of cladding is also the fact it comes with an expansion gap. So what does this mean? Well, put simply, it provides space for the timber if it swells due to temperature or moisture changes. 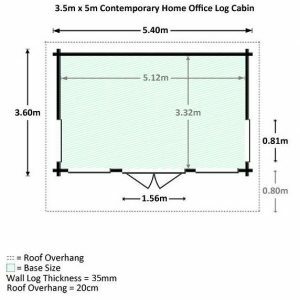 Technically speaking, this shouldn’t be a problem with this cabin as even the standard 34mm thick logs are extremely resistant to warping. However, there is still a chance small changes could occur in the timber throughout the seasons. So it’s good to know the building has that gap and it won’t alter the structural strength of the cabin. Internally the building also benefits from a thick, smooth, high quality frame. 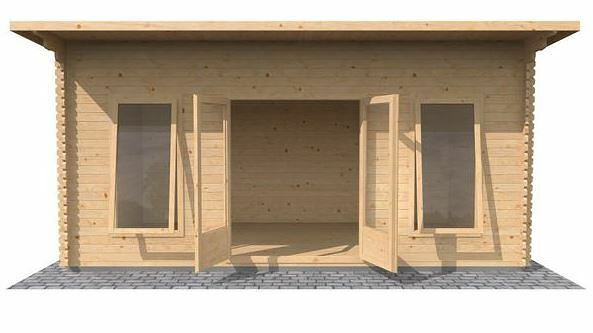 The manufacturer has also added corner joints chalet connections to add even more strength to the cabin’s structure. These can be seen on the exterior of the building and they also have a very unique, stylish design. In order to support the 19mm tongue and groove cladding, 44mm roof joists are used to complete the thick, strong and sturdy frame. Like any wooden building, this cabin needs to be treated with a good quality preservative once it has been erected. This will help to make sure that you benefit from the 10 year anti-rot warranty. As it is quite a substantial building, you can expect this to involve quite a lot of work. You will definitely need more than one tub to cover it. Taking into account the size of the building, we’d recommend using a spirit based treatment. Initially this is more expensive than the water treatments you can buy. However, you’ll find that many of them don’t need to be applied as frequently as the water based ones. So in the long term you are saving money and a lot of maintenance time. We’re a little disappointed that Waltons don’t include a free treatment with this cabin. We think, taking into account the cost of the building, a free treatment would add to its value for money. However, you can find both spirit and water treatments online and if you shop around you should be able to find a good deal. Both the doors and the windows on this cabin feature a unique, modern and stylish design. They are also glazed, either with single glazing as standard or double glazing if you choose to upgrade. Talking about the doors first, the building features double doors, both with a large glazed panel. Below this glazing is a wooden panel with a recessed detail. The flat design continues the cabin’s overall streamlined look. They are secured with a mortice lock, helping to make them difficult to break into. We like the glazed design of the door as it adds a lot more internal light and also gives you an excellent view of the garden from inside the building. Located in the centre of the cabin, they open up to provide wide access, helping you to get bulky, large furniture into the building without any hassle. The two large glazed windows are located on either side of the doors. We especially like that they open up to allow ventilation into the cabin. This is an important feature you’ll be glad of in the hot summer months. The way that they open out is also unique, pushing out from the bottom, rather than opening up at the top. As mentioned, single glazing comes as standard, measuring 4mm thick. The double glazing option increases the thickness to 16mm, offering a lot more warmth and noise reduction. It is worth noting that if you do upgrade to double glazing, both the doors and the windows will be upgraded. You cannot choose one or the other. This isn’t really a private building, though there are measures you can take to make it more private if you want to. For example, you could hang curtains or fit blinds behind the windows and doors. The glazed panels are really big compared to what you typically find on most outdoor buildings. So if you are using this as a home office, you will need to be wary of leaving a desktop computer or laptop in full view. Whilst privacy isn’t really a high priority on this building, security is. First up you have the very thick, incredibly strong log cladding. This is going to prove almost impossible for anybody to break through. This means the only way into the building is either through the doors or the windows. If you upgrade to double glazing, the windows are going to prove difficult to break through too. However, even without the upgrade, if you do install curtains you can limit the temptation for thieves to break in. If they can’t see what’s in there, they will be less likely to take a risk. The doors have the most notable security feature – the mortice lock and key. This is actually built into the door, rather than just attached onto its surface. So it isn’t going to be easy to remove. As it is locked with a key, you can control who has access to the building at all times. All in all we’re impressed by this cabins security and don’t think it could be improved in any way. This outstanding building comes with 3 different customisations options. You can choose to customise the glazing, roofing felt and the thickness of the logs. If you have the money, we’d definitely recommend considering upgrading the thickness of the logs, as well as the glazing. So what options do you have? Firstly let’s talk about the log thickness options. As standard, the logs that come with the cabin measure 34mm thick. This is pretty substantial and does supply a very high level of both security and weather resistance. However, Waltons also give you a slightly thicker 44mm option. Whilst the extra cost may seem staggering, it doesn’t just offer extra strength. The 44mm thick walls benefit from a double wind channel which really help to insulate the building and increase its weatherproof qualities. This means in the colder months, you’ll find the building much more comfortable to work in. The other worthwhile customisation option is the glazing. Single 4mm thick glazing is included as standard, but you also have the option to upgrade to double glazing. This increases the thickness of the glass to 16mm. This is quite a drastic change and like the additional log thickness, it really helps to boost the insulation of the cabin. Not only that, but you’ll experience lower levels of noise which can be really useful if you are using it as a home office. Whichever glazing option you choose, it will be applied to both the windows and the doors. Finally the last customisation option available is the roof. Waltons gives you the option to customise it with either Superior duty felt or Armourshield Shingles. Heavy duty sand felt comes as standard, though some may find this is a little flimsy. It is designed to offer great water-resistance, but the superior felt will add a tougher, longer lasting protective barrier. It has been constructed with fibreglass and comes with a self-adhesive backing to make it very easy to fit. There’s the added benefit of having olive green or charcoal colours to choose from too. However, if you want to truly get the most out of the roof, we recommend the ArmourShield shingles. Like the Superior Duty felt, these shingles come in a charcoal or a green colour and they supply the heaviest level of protection. However, it is the decorative benefits which mainly draw people in to buy them. Now, as this cabin comes with a pent style roof, you can’t actually see the top of the building like you can with an Apex roof. So we personally feel the decorative benefits take a back seat with this cabin. We’d mainly recommend them for their high quality weather resistance benefit. You will receive 9 packs of self-adhesive shingles which is just enough to cover the size of this roof. They feature a technologically advanced design and will ensure the roof lasts far longer than it would with the heavy duty felt. 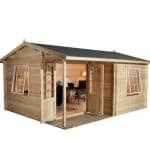 You will see there’s three extras available to add to the cabin, though we’re a little confused by the 3.4m x3.3m Waltons Standard Log Cabin Studio with Veranda. This is an entirely separate building and measures not much smaller than this log cabin. So it’s hardly an ‘extra’. 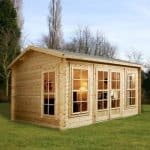 However, if you have a particularly large garden and you’re looking to complement this Barbados cabin, the standard cabin could be a worthwhile add-on if budget isn’t an issue. One of the more useful extras that will enhance the comfort of the cabin in winter months is the Eco-Quilt Garden Building Insulation kit. Opt for 30 square metres or 60 square metre kits. The latter basically provides thicker insulation and will give you the warmest, windproof benefits. Both kits offer insulation that benefits from 6 great thermal wadding layers, breather foam and a reflective foil layer. As well as the actual insulation, you are also provided with a staple gun, cutting knife and foil tape for installation. It can be used on the roof, walls and floor of the building and full instructions are provided. The last extra Waltons offers is various solar panel kits. Some are roof-mounted, whilst others are free-standing. They come in different voltages and wattages, providing varying levels of power. These are a very expensive extra, though we think the long term cost saving benefits definitely make them worth considering. 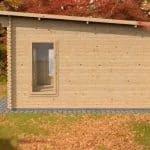 This cabin is designed as a home office, which means you will require some power in the building. Not only will you need a source of light, but you’ll also need to power your computer and other office appliances. The only other way to do this is by installing an electrical pack. Whilst these packs aren’t as expensive as the solar panels, they do come with long-term running expenses. Once the solar panels are installed, they use renewable energy which is not only free, but it’s also better for the environment too. It is worth comparing the different kits available to see which best fits your needs. Some for example, are only designed to provide a small amount of power, whilst the more expensive panels are capable of powering multiple appliances and electronics at the same time. You won’t find a better quality log cabin. Even its standard build without any customisable upgrades offers an exceptional quality finish. 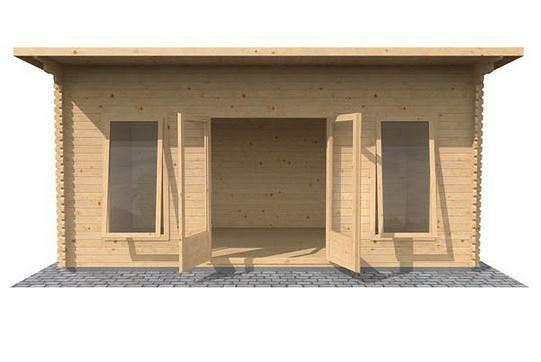 As the cabin is constructed with super-thick logs, it offers an extremely long lasting design. Even if you chose not to treat the building, it would still likely last well against the elements for years. However, it would eventually start to deteriorate and due to the high cost of the building it makes sense to ensure it is fully protected. You can comfortably store a variety of furniture in this building, including an office desk, chair, filing cabinets and a small sofa. It offers great potential and the walls are definitely strong enough to accommodate shelves if needed. It is worth pointing out that the assembly of the cabin isn’t difficult to understand. The instructions are clear and with the right tools you’ll find it fairly simple to put together. However, make no mistake – this is a very heavy building to erect. It is also going to take a substantial amount of time to put together. 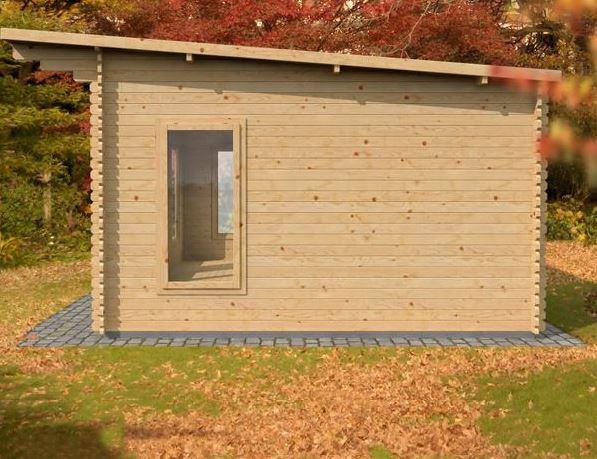 Whilst this cabin isn’t going to be within everyone’s budget, it does offer superb value for money. Its longevity is impressive and its stylish design makes it a unique building to have in the garden. However, the fact you do need to spend a lot of additional money to get the most out of this building has lowered its rating. Final Thoughts: We just love the unique design of this great pent home office. It’s unlike most traditional outdoor buildings and benefits from an exceptional amount of high quality features. The only disadvantage is the fact you do need to spend quite a substantial amount of extra money if you want to upgrade and get the most out of its impressive features. So it isn’t an ideal choice for those on a budget. We especially love its contemporary design and pent style roof. Everything is flat-lined and even the standard variation of this building is made to an extraordinarily high standard. The amount of light let into the building is also excellent thanks to the large glazed windows and doors.